2 Bedroom House For Sale in Truro for Guide Price £495,000. Dating to the mid 19th Century, this Victorian semi detached property has been in the same ownership for over 30 years and has been a much loved holiday home. The property has been extremely well cared for and retains period details but would now be considered ready for renovation. Surprisingly light and airy and with generous ground floor accommodation, the property has the potential for extension as many of the other properties in the row have been (subject to the required consents). The property is approached from the road via a garden gate leading to the front garden. A small front porch with period storm shutters and part glazed and panelled door leads into the entrance hall, with door to the living room, stairs to the first floor and further part paned panelled door leading to the rear hall. The sitting room has a wide bay window with uPVC double glazing and enjoys the lovely harbour, village and headland views. The dining room has a double glazed sash window to the side, crockery cupboards and deep under stairs cupboard. The kitchen has a range of base units, stainless steel sink, window to the side and multi-paned window to the rear. At the back of the property is a large covered area, with a gardener's WC, garden store and workshop. An exterior door leads to the side of the property. 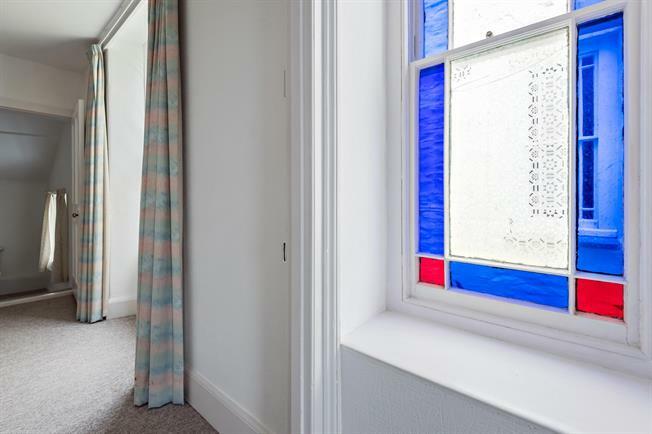 On the first floor landing is a beautiful period stained glass sash window. The front bedroom has a double glazed sash window to the front with sea views and two built in cupboards. The second bedroom has a window to the side, access to loft space and door to the bathroom. The large family bathroom has an obscure glazed window to the side, airing cupboard housing a pressurised hot water tank, panelled bath, pedestal wash basin and WC. To the side of the property is a narrow drive, believed to be shared between this property and number 7 and providing access to the rear gardens and garage. The garage for this property is now used for storage and it should be noted that the vehicular access is only wide enough for smaller cars or boats/dinghys. The following services are available mains electric, mains water and mains drainage. Electric heating is provided from night storage heaters. The adjoining property has planning permission to rebuild and party wall arrangements will need to be satisfied. Please contact the seller's agent for further information in this regard.